I made this up in a morning, it’s a nice quick one to sew! I chose the shortest length, and I halved the width of the collar as I’m still not sold on the huge width of the original. I also didn’t interface it, which is something I’ve seen debated over on Instagram! I like the softer look of the uninterfaced linen. I’ve popped a couple of hand stitches at the centre back, shoulder seams and the hem to keep it folded over neatly though. As I was doing pre-trip panic sewing, I had to use stuff from my stash, which is always a good thing! I love this ochre/mustard coloured linen, so I was really glad to get to use it for this project. 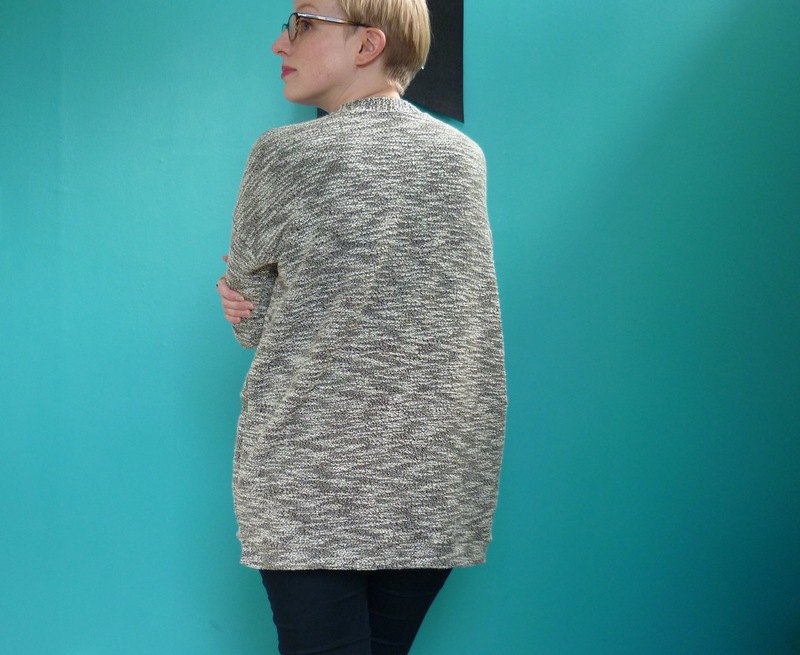 It’s beautifully soft, but is also a bit slubby and textured, which is lovely. For the lining I used a length of Atelier Brunette cotton lawn which I bought at Sew Over It in London last year. I love the pink and mustard and turquoise colour combination, but the lawn was so fine and transparent that I was really struggling to think of a pattern for it. I’m really loving pink and mustard together at the moment though, and the mustard splodges on the lawn are almost exactly the same colour as the linen so I figured it was meant to be! Unfortunately, the colour of the linen showed through the pink and made it quite dull and dirty looking, so I had to underline it with another pale pink cotton which was also languishing in my stash. That was easy enough to do, but it did add a few more steps when I was already feeling the time pressure! I’m really glad I did it though, it makes the pink look much fresher. The three layers of fabric also give the jacket a lovely weight, I think it’ll be the perfect layering piece for this spring! So it is over-sized, but I think picking the shortest length and reducing the width of the collar means that I don’t feel swamped in it. Sewing it up in soft, unstructured fabrics helps too! I feel like it’s different enough to my Kochi kimono that they both have a place in my wardrobe. The sleeves on the Wiksten are definitely more practical than the huge sleeves on the Kochi, and I feel like I could probably squeeze this underneath one of my coats if I wanted to. I can only fit my Kochi sleeves inside the equally huge sleeves of my Sapporo coat! 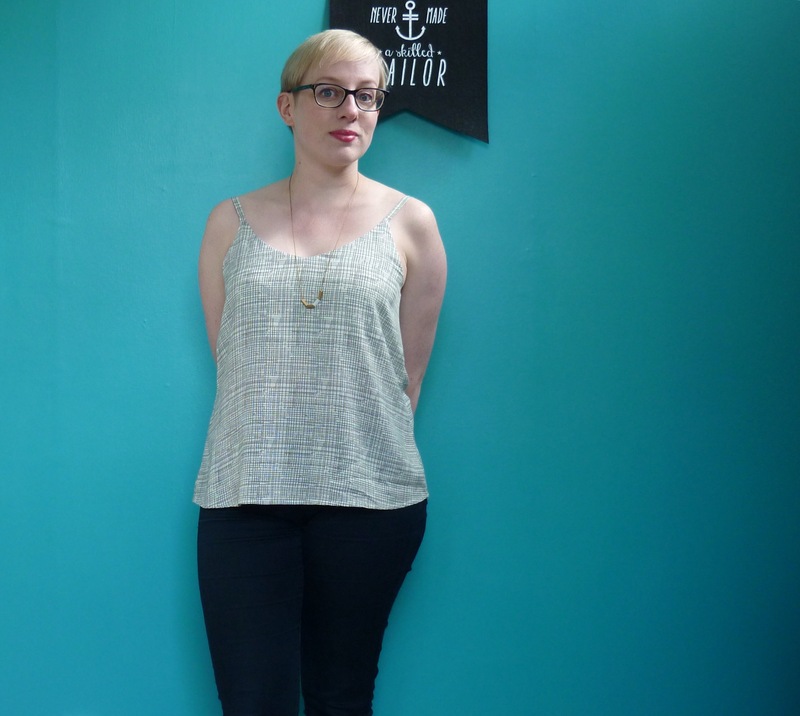 I’m going to do a brief two-for-one in this post and talk about one of my favourite makes this winter, a Sew Over It Molly tee (from their first e-book, City Break). 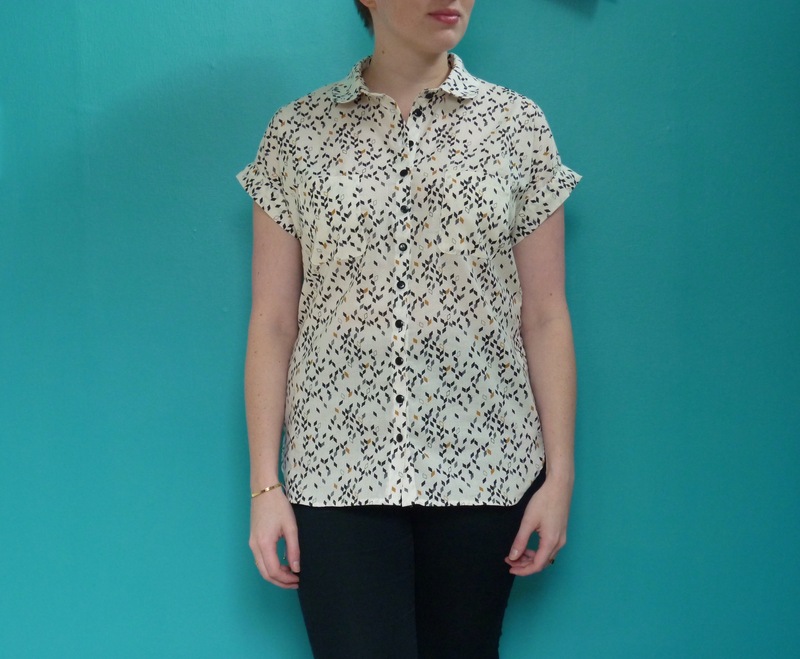 I made it up in the most beautiful remnant of Atelier Brunette french terry from Miss Maude Sewing. I was waffling about whether or not to buy some when I saw she had listed a remnant piece, and I’m so glad I bought it! It’s so soft and snuggly. Initially I was planning to make a sweatshirt out of it, but when it arrived it was much thinner and drapier than I expected and I decided it would be a lovely long sleeved tee shirt instead. 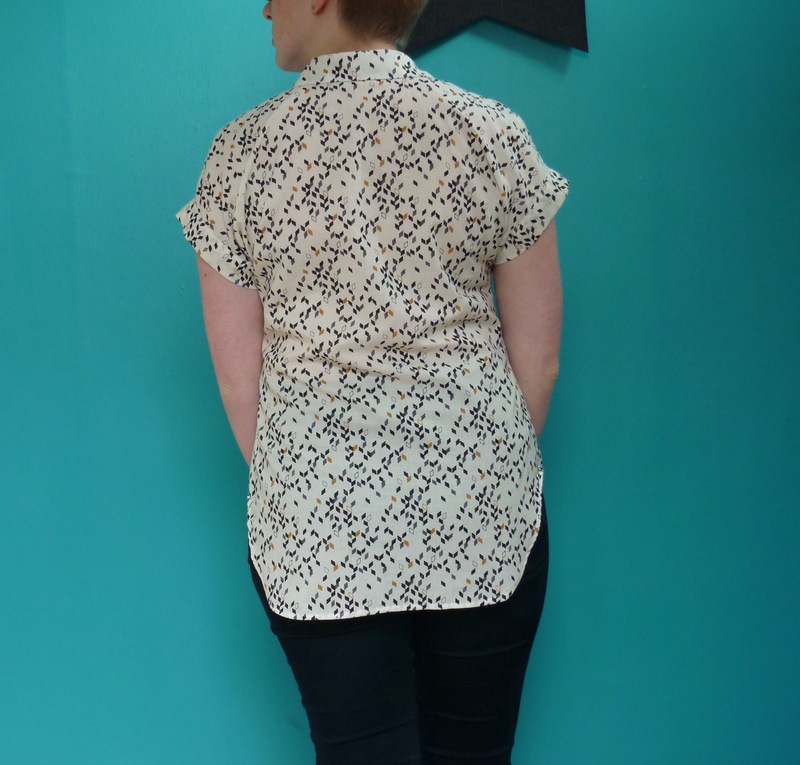 I picked the Molly Tee because I couldn’t fit a traditional set-in sleeve onto the length of fabric that I had, but the pretty extreme drop shoulder of the Molly means that the sleeve pieces are a lot shorter and fitted on my fabric perfectly! 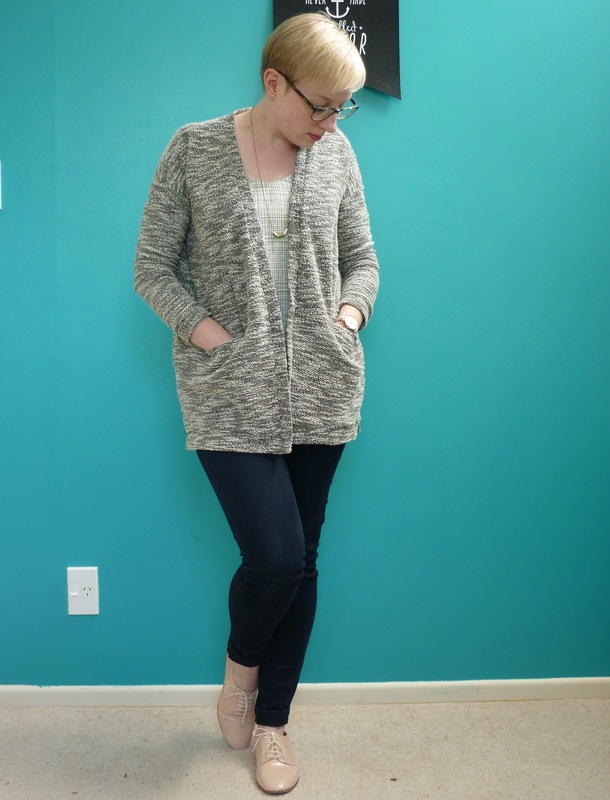 I’ve worn this top so much over the winter, it was a great layering piece, and I think it’ll be good on its own into the spring as well. The metallic gold pattern on the navy makes it a little bit fancier than my other long sleeved tee’s as well! I look like such a dork in this photo that I thought I should definitely include it! Hi team! I’m having a bit of a sewing hiatus at the moment, aside from finishing a few bits off. I really need to put my head down and get some solid work done on my research project, I need to hand it in next month! I’ve finished the data collection phase, and I’ll hopefully be done with my data analysis this weekend…then I just need to finish writing the damn thing. I’m really looking forward to mid October! But in the meantime I have a few new things to post to keep things ticking over here. This is what I’m affectionately calling my marshmallow coat, which I’m sure doesn’t need explaining! It’s the Papercut Patterns Sapporo Coat, a pattern which I had admired on Instagram (where there are some amazing versions! ), but had never really felt the need to make. 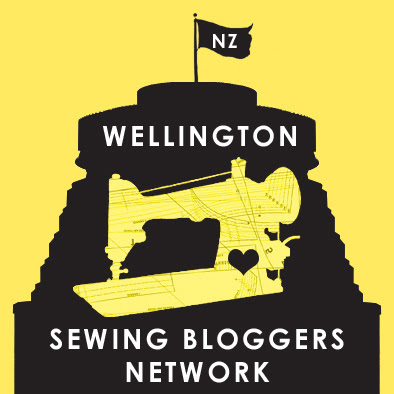 I was sure it would look too oversized and daft on me, and the fact that it has no front closures made me think it would have limited wear-ability in Wellington. Then I got the opportunity to try on the beautiful grey wool version made by Gabrielle, and I flat out fell in love with it! It is huge and oversized, but in a dramatic and elegant way, and I had bought the pattern and was cutting it out before I knew it. Look at those beautiful swooshing seams! I had a lot of fun sewing this coat up. It’s a big but pretty simple project, as far as coats go. The sewing is all simple, with it’s dropped sleeves and grown-on facings and pocket bags, but each seam seems to go on forever! I made a couple of simple alterations, based on what Gabrielle had done with hers. I made the smallest size, and took an inch off the top of the sleeve and from the armscye, to shorten the sleeve by 2 inches total. I wanted the bracelet length sleeves from the sample photo, and they would have covered my wrists as drafted. I also opted to line the sleeves with my lining fabric rather than the wool I used for the outer, which cut down on bulk and made the coat feel lighter overall. Finally, I ran some seam tape along the diagonal front seam, which will hopefully help the pockets retain their shape. I used a blush pink wool/cashmere blend which I’ve had in my stash for over a year, it originally came from The Fabric Warehouse. I really love the colour, but I struggled a bit to match it to a pattern. I was seriously planning to use it to make a Gerard Coat from Republique du Chiffon, but in the end I’m glad I went with Sapporo! The wool behaved beautifully, of course, it sews and presses like a dream. It does crease a bit, as you can see in these pictures after a day of wear, but I can live with that! I lined it with another stash fabric, a Liberty Tana Lawn from The Fabric Store. It’s so smooth and lovely! I’m glad I finally used it for something, and I think it looks really pretty with this pink. And how nice are those mitered corners? This really is a lovely pattern to sew. Because I was having such a nice time sewing this I decided to pull out all of the stops and use one of the beautiful “HANDMADE” labels that I bought from Arrow Mountain to finish it off. It’s subtle, but I love it! I’m not going to lie, when I finished it and put it on for the first time I was worried that I just looked like a big pink lump. But after wearing it for a day (and getting a few complements from strangers on it!) I decided I really loved it. Funny how that happens sometimes! I’ve only managed to wear it out a few times since I finished it a couple of weeks age, the weather has been less than ideal recently, but I think it’ll be perfect for Spring and for Summer mornings. I’m looking forward to getting out and about in it! I’ve had a bit of a sewing spree since the end of the University trimester, I’ve been enjoying spending my spare time in my sewing room (part of me is secretly glad that the weather has been pretty rubbish, because it means that I don’t need to feel bad about not fixing up our jungle of a garden). One thing that I really wanted to get done was a rayon dress made using the Helmi pattern from the latest Named collection. Helmi is a loose fitting dress with a curved hem and a concealed half button placket, and either a two piece collar or a simple band collar. 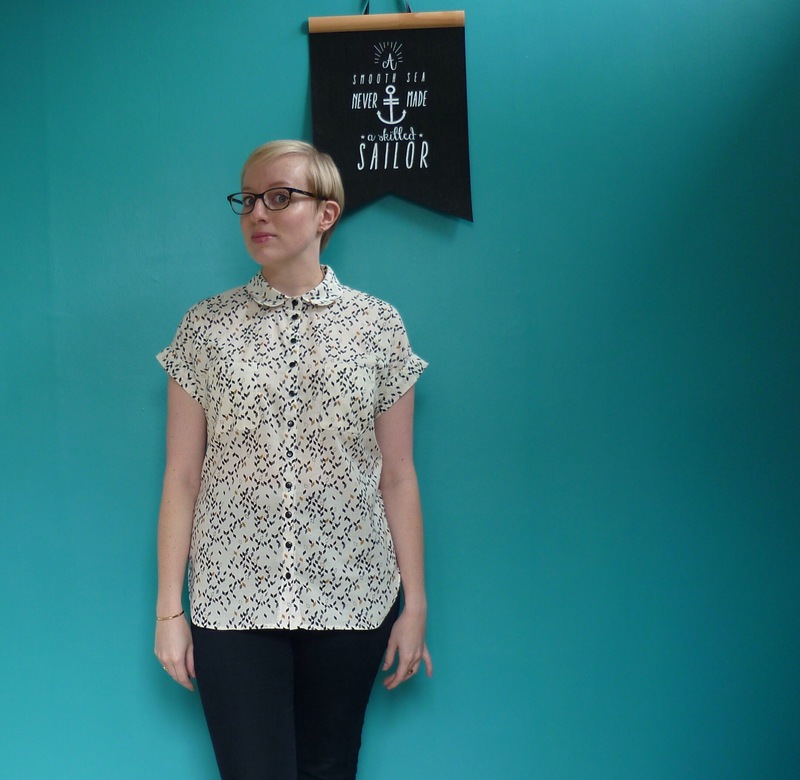 The pattern also has a really interesting shirt variation, which is definitely on my radar now for Autumn/Winter! It’s definitely a loose fitting silhouette, and I have to admit that I thought it was probably going to be an unflattering disaster as I was sewing it. I was very surprised and very happy about how much I liked it when I tried it on after getting the sleeves in! I think the very soft and supple rayon helps it to drape more flatteringly that it would if it was made in a fabric with a crisper hand. 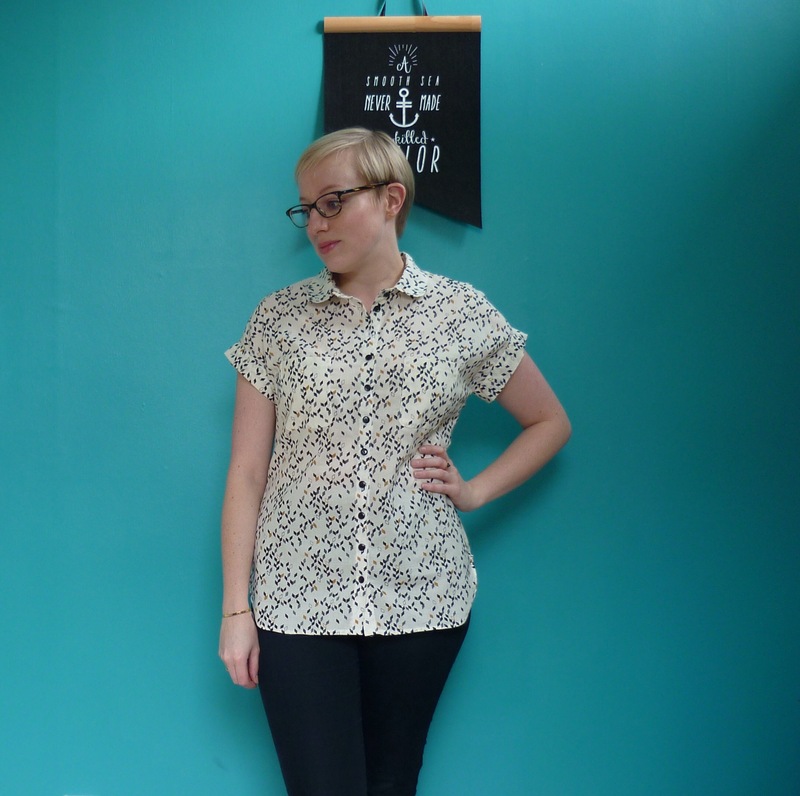 This fabric is the same as the stuff I used for my Ogden Cami, and it’s just as lovely. I have another length in a different pattern in my stash, and I might end up buying some more! It behaves so well, and drapes and presses so nicely, it’s so good to sew. Like with all Named Patterns, there are some lovely details in this dress. 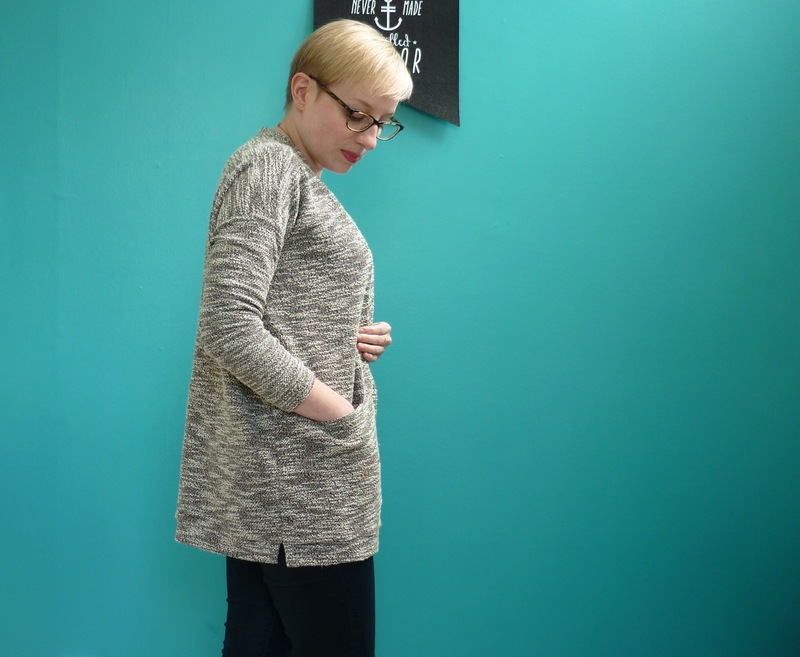 I love the curved hem, it’s just short enough at the sides to stop it being heavy and frumpy, but not so short that I have to think about not flashing too much thigh as I move about! 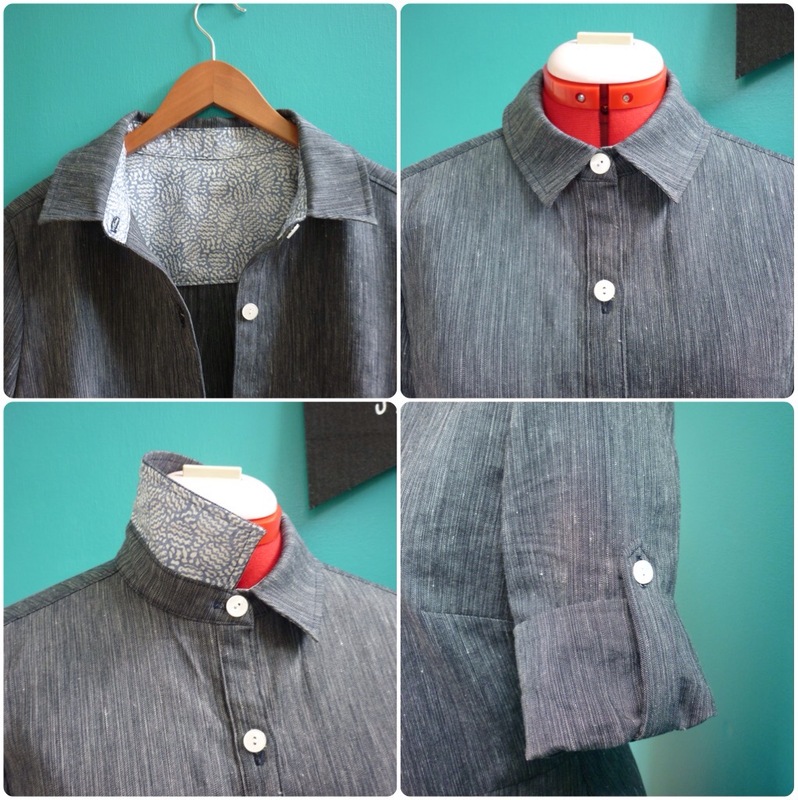 I also love the concealed button placket, it gives the front a lovely minimalist feel. The construction of it made me a bit confused when I was reading through the instructions, but once I had the piece in my hands it became clear. Typically, I think these hidden buttonholes may well be my best to date! I feel like I’m finally getting better at judging the right size of buttonhole to sew, and I’m getting much better at finishing them neatly too. I used plain black buttons for the placket, and they blend into the fabric nicely when the first few are left unbuttoned. For the collar button I used one of the brass buttons I’ve been hoarding off a RTW cardigan, I love them but I’ve never managed to find any similar in craft shops! I don’t think I’ll ever wear this one buttoned all the way up to the neck, it’s a bit too much fabric with the longer sleeves and hem! I felt like the sleeves looked a bit plain just hanging at elbow length, so I hitched them up slightly with a faux button loop. I just sewed a narrow rectangle of fabric and hand sewed it to the sleeve with another of the gold buttons, just high enough to catch the hem and add a bit of interest. It’ll be easy enough to remove them if I decide I want to do something else with them. This was a pretty simple sew, aside from the slightly more difficult concealed placket. The instructions are slightly more minimal than some other indie patterns, but they’re well illustrated and easy to follow. The only change I made, aside from my minor addition to the sleeves, was to top-stitch the collar stand and to take 1.5 cm off the length of the bodice (as usual). 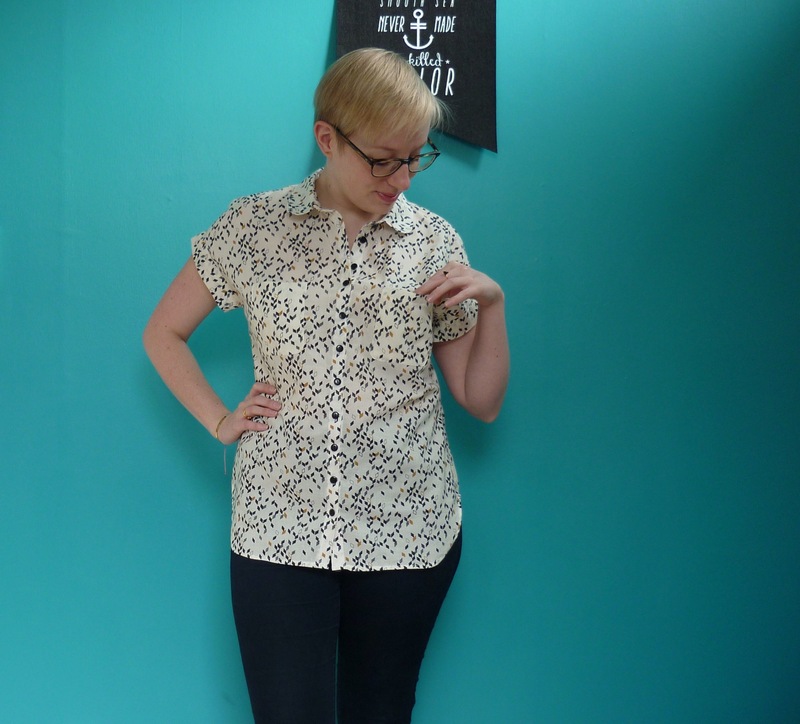 I chose to top-stitch all the way around the collar stand as the rayon looked a bit bubbly and soft without it, it sits much better now with that little bit of extra reinforcement. I did take a bit of a risk by hemming the skirt pieces separately before sewing them together and to the bodice, but after the trouble I had hemming the curve of my Melilot shirt hem I decided to follow the instructions and just hope that it wouldn’t be too long. It is longer at the back than I expected, but I like it anyway! The hem definitely sits better on this than it does on the shirt (following the instructions can be beeficial, who would have thought?). I like the way it looks with a belt as well, it makes it feel a bit more dressy. I think with a pair of heels I could get away with wearing this out for drinks or dinner, but with flats or even sneakers it would be fine for a casual day. I do love a dress which can do multiple shifts! 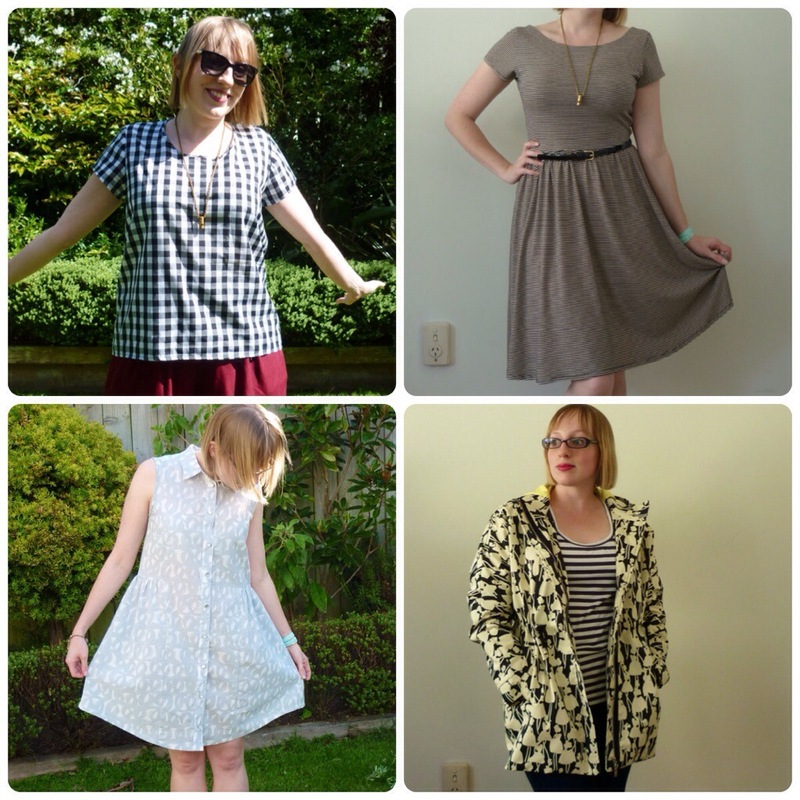 I really like Deer and Doe patterns, and when they released their spring/summer 2016 patterns I immediately bought both the Melilot Shirt and the Zephyr Dress. I meant to make the Melilot shirt up during the winter, but I just never managed to get it done…Happily I like the short sleeved version even more than the long sleeved one, so making it up for spring wasn’t a hardship! I’m so happy with the way it turned out! I think its such a flattering shape, and the little round collar and the sleeve cuffs are so cute. I was a bit worried about the very curved side seams not hitting me at the right point, since I have a fairly high waist, but I threw caution into the wind and made it up as is in my good fabric. Thankfully it worked out pretty well! I had a bit of trouble getting the hem to sit nicely around those extreme curves. The instructions tell you to hem the fronts and back before sewing the side seams, but I was a bit wary of the length so I wanted to be able to try it on before I committed to hemming it! In the end I decided to leave the length as it is, though I might play around with it next time. I ended up sewing a line of basting stitches at 1/4 of an inch to help me fold it up, then folded it up the same again and topstitched it. Maybe I’ll try bias tape next time, I’m always happy with that finish! There are some really lovely details in this pattern. The pockets are lined! I’ve only ever lined the pockets on a coat, but it does give a lovely smooth edge and makes it easier to get both pockets the same. 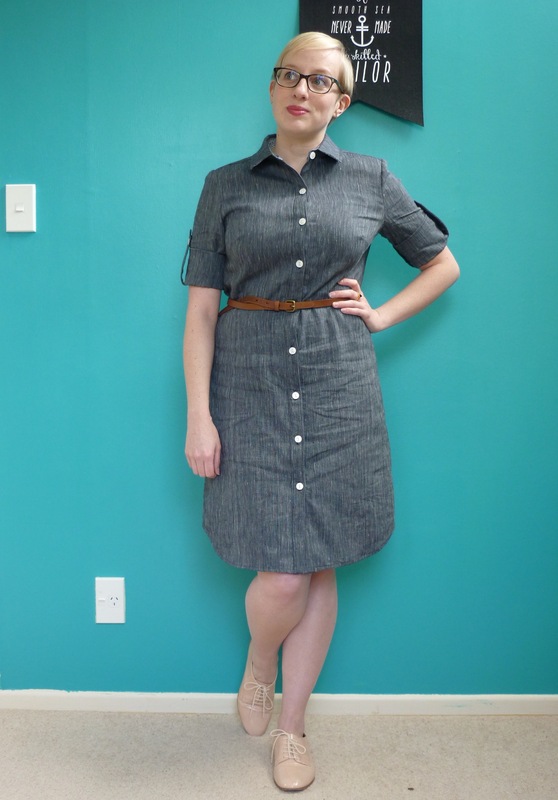 Though in this busy fabric that isn’t such a major… I also really like that the collar on this shirt is a proper two piece with a collar stand, it sits really nicely and fits really well. 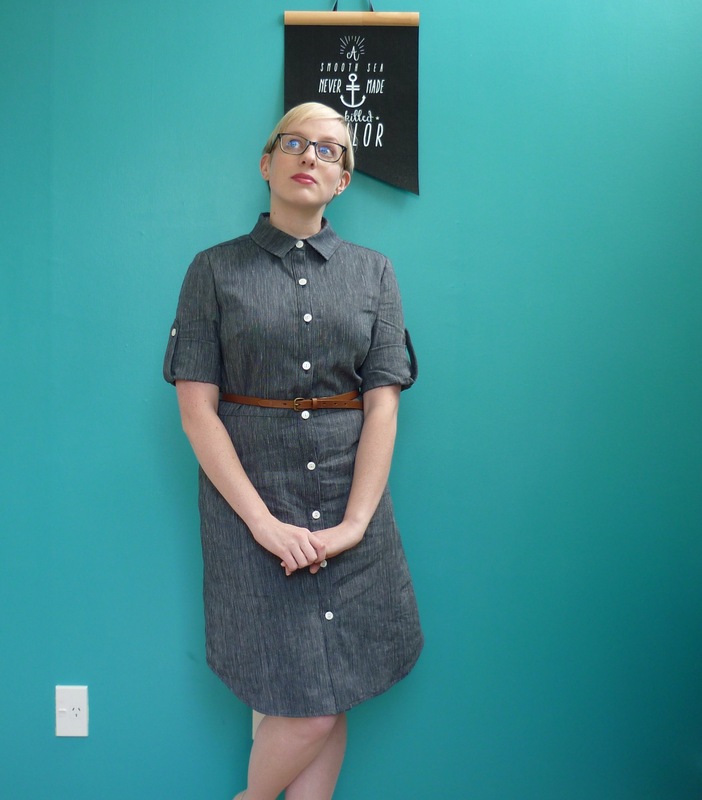 I noticed when I was looking at the pictures of my M7351 shirtdress that the collar is really too big for my neck to be worn buttoned all the way up, but this one is a good size. One thing I wish I had done better is matching my thread colour to the fabric. 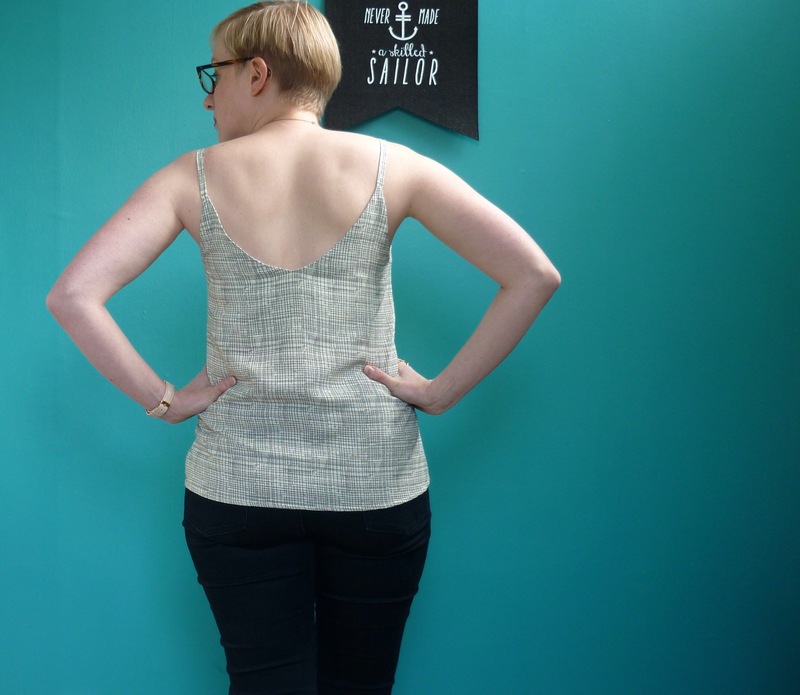 I sewed the majority of this one in the evenings, and it wasn’t until I looked at my topstitching in daylight that I realised that it was really really white against the much more cream fabric. And then, instead of fixing it, I just carried on, and sewed the buttonholes in the same white thread. And of course, the button holes look even whiter and shinier than the topstitching… I wish I had waited and matched the thread, or that I had gone and fixed it before opening the buttonholes, but I’ll live with it! Those glaring white buttonholes will be a good reminder not to be lazy next time. I know you can’t see them in these photos, but I can definitely see them when I look down at the shirt! The fabric is Atelier Brunette, French fabric for a French pattern! Last month there was a vintage fair in my local town hall, so I wandered down to have a look (hoping to find a pie dish, as I had just figured out that the one I was looking for in my kitchen actually belongs to my Mum, so was in her kitchen instead). Just inside the door was a pile of stunning bolts of French fabric, attatched to a stall that I realised was being run by Miss Maude. Thank god she was taking payment by automatic bank transfer (and thank god for banking apps! ), because I would have been sad to miss out on this gorgeous cotton. I also bought a length of Atelier Brunette modal, so I’m sure that’ll be making an appearance this summer! The little black buttons came from my button stash, but I think they originally came from Made Marion, like most of my new buttons. I really like how they look on the fabric, though sewing 11 button holes was a bit of a chore! So it’s technically Spring down here in the Southern Hemisphere, but the weather in Wellington this month has been particularly horrible. We’ve slid back into single digit temperatures, and we’ve had hail and gale force winds and torrential rain, so my spring sewing has been bumped back a few weeks! 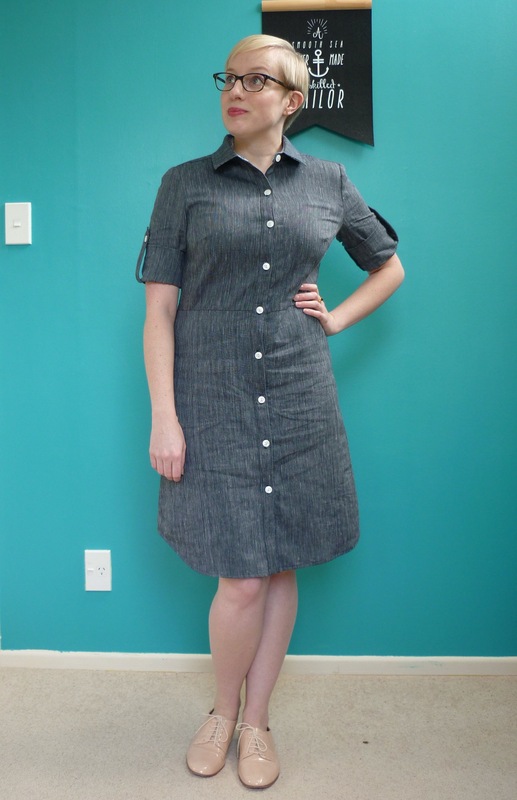 I had meant to make a shirt dress out of this fabric last winter using McCalls 6696 (the pattern which barely needs an intoduction) but I had a list of adjustments that I wanted to make so I never got around to it. 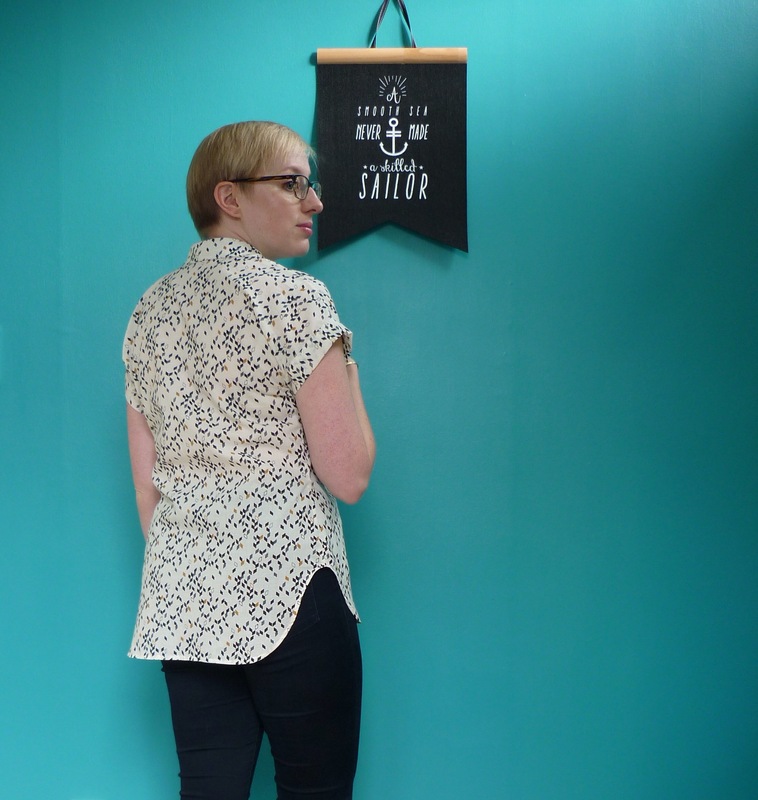 Then McCalls 7351 was released, and it had most of the features I was going to try to change M6696 to have (the shirttail hem, the slim back without the gathers, no waistband), so I cheerily switched patterns, and then fluffed around all Winter and never got it made. But finally, here it is finished! I really enjoyed sewing this dress! I haven’t had a lot of practice with big 4 patterns, but I’ve recently bought a bunch because I’ve had such a good time sewing up the ones I’ve tried. I’ve found that I get the best results if I sew a 12 in McCalls patterns, even though my measurements put me in a 14. M7351 has multiple cup sizes, and I used the C cup bodice. I think it fits well, though it does look like I have a bit of gaping at the buttons across the bust in these pictures. I love the curved hem and the sleeve tabs! I did my usual adjustments here, I took 1 inch off the bodice length, and another inch off the bottom of the back bodice at the centre back for a sway back adjustment. I also shortened the skirt by and inch and a half. The only place where I ran into a problem was the sleeves, they tapered so much towards the elbow that I couldn’t lift my arms when they were rolled up into the sleeve tabs. I ended up shortening them by 3 inches, and they’re much better now! I’ll never wear them not rolled up, so I don’t care if they’re weirdly disproportionate now. The fabric is a cotton/linen/elastane blend, so it’s really light and breathable and holds a crease really well (good for sewing, less good for wearing…), and has a little bit of stretch. Its basically a really comfortable lovely fabric, and I’m really glad that I have enough left to make a pair of shorts! The buttons are fake shell ones that I found in the $1 bin at The Fabric Warehouse, which is my favourite place to find packets of buttons. I also used some Liberty Saville Poplin to line the yoke and for the under collar and inner collar stand. Holy crap, I can’t believe I only have one month left of my ‘make a thing a week for a year’ challenge! I also can’t believe its Summer tomorrow, and the start of the Christmas season. I’m looking forward to digging out my Christmas decorations and doing some Christmas baking (I love gingerbread and fruit mince pies, even though neither is particularly seasonally appropriate for the southern hemisphere…), but I’m really looking forward to more sunshine, warmer weather and summer fruit arriving in the shops and in my garden! This month has been a successful one, sewing-wise. My Grainline Scout and Alder are two of my favourite me-made items so far, and my Moneta has already had a fair bit of wear. 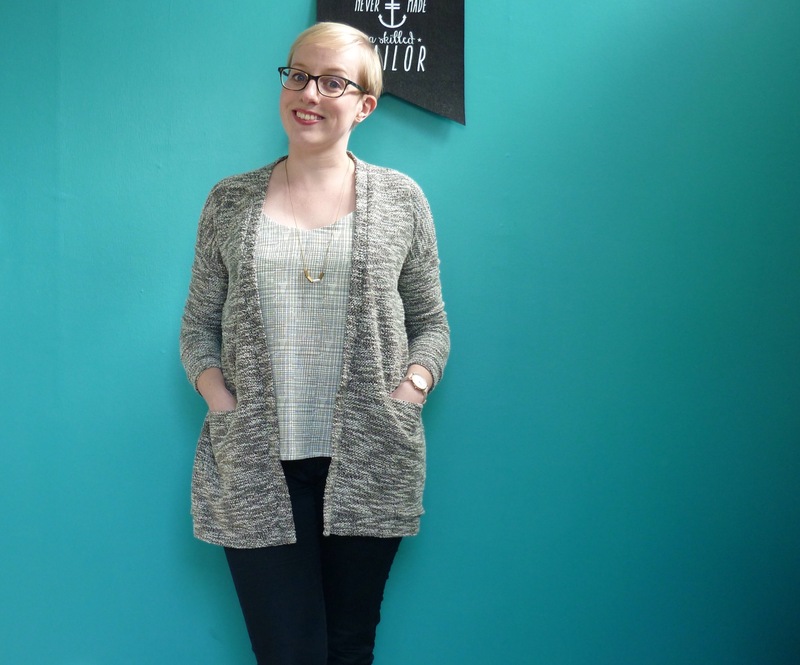 I’m really glad I finished my Malu coat, even though it isn’t quite what I envisaged when I started it, so many months ago! I think that the projects this month have taught me a bit about compromise, and making the best of a situation. Sometimes that works out awesomely, like with the triangle cutout on my Scout tee, and sometimes its just the reality of the situation, as it was with my Malu. You can’t win them all, and at least I managed to get wearable garments out of each situation! I haven’t got a huge amount to add this month, all of my projects used techniques I’ve used before, so there was nothing new to learn. I was much more confident putting the collar on my Alder shirtdress this time than when I made my Archer shirt all those months ago, and I’m really happy with how neat it looks. I’ve also learned a valuable lesson about picking knit fabrics. 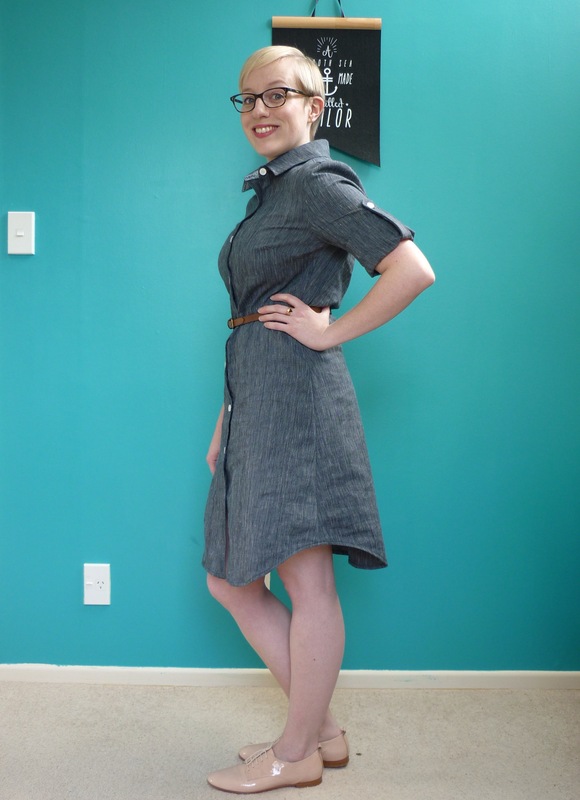 When I compare my first Moneta with my second, the recovery of the striped rayon knit is so much better than the merino I first picked, and has resulted in a much more wearable dress! The first one is so cozy and warm, but I think I might end up repurposing the fabric and making another one in a merino blend for next winter.